What is a Millennial anyways? And why does the church want us? So as not to be left out of the loads of internet conversation about this article written by American blogger, Rachel Held Evans, I figured I would throw in my two cents. If you follow down into the comments section this follow up post to her first article, you can see that the blogosphere seems to be rather inspired by her thoughts. Her article reminded me of something I wrote just over 2 years ago for a local paper in Stony Plain, AB. I have two confessions to make. The first is to those who don’t regularly attend church or consider themselves religious: I am a Lutheran Pastor. 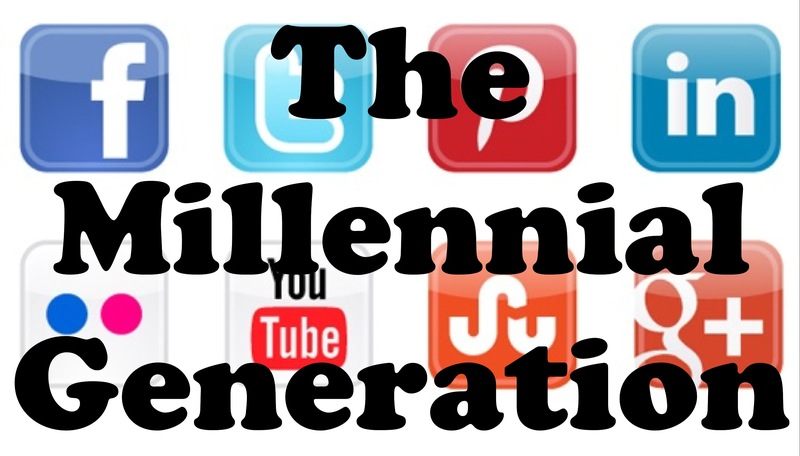 The second is to those who are actively involved in churches as members and adherents: I am a Millennial. What is a Millennial you say? Well, we are a generation. We are the children of Baby Boomers, and we follow generation X and some call us generation Y. I was born in 1982, but those in my generation were born between the early 80s and early 2000s. Many of us have a very different life experience than that our predecessors. Computers, the internet and cell phones have been around most of our lives. Our parents were not disciplinarians, but more like friends. We expect to work with others, and to be treated equally in the workplace and community, despite our perceived lack of experience. We see value in a variety of ideas and points of view. Many of us are passionate about the issues facing our world: the environment, poverty, education, politics. We also like things like social networking, video games, youtube, and bad reality TV. We grew up in a tolerant, multi-ethnic, multi-cultural, multi-faith world. Millennials are uncommitted to institutions, like the Church. We like options and having choice. Our parents, teachers, coaches, instructors, and community leaders have told us our whole lives that we can do anything and be anything. And we have been told that fixing the world’s problems will fall to us – we carry the burden of being hope for the world. And for people of faith, we are the generation that is distinctly absent from most churches. In my denomination, I am the second youngest pastor serving in Canada. I am also the only 20 something that attends my congregation on regular basis (they do pay me to be there after all). A lot churches are wondering how to get us back, how to entice, attract and charm us into the Church. The rationale is that organ music, hymnbooks, pastors in white robes and old styles of worship are too boring for us (all of which our congregation uses in worship). But let me tell you this: rock bands, projection screens, video sermons and laser light shows won’t get us there either. If you catch us in a moment when we are not distracted by Facebook status updates or funny internet videos, we might tell you what we really want from Christians are honesty, integrity and meaning. We want to know that faith isn’t just a set of rules or ideas that we have to swallow whole. We want to know that faith isn’t easy but requires struggle. We want to know that being part of church isn’t just about dropping money in a plate, but about being welcomed, loved, forgiven and challenged by a community of faith. And now some more thoughts on being a Millennial. Being a millennial pastor, I often feel like I am living in this weird world where church members will ask me how to… well, get me back in church, or my generation. Yet rarely am I asked why I stayed, or how I was “retained”. Many of my older colleagues, mostly Boomers, tell me and other young pastors that we are the hope of the church, usually with the weight of the church visibly sitting on their shoulders. Yet, we are rarely given the reigns to lead the church into future (although that is changing as my second call was to be the Senior Pastor of the biggest church in the synod I was serving). And it feels even weirder to be intensely focused on as a group by church folks. Nearly 30% of people in Canada are boomers, making them the biggest age group alive. And I know scads of boomers have left the church too, yet how many of us are wondering where they went as much as where the Millennials went? I think the generational focus is bigger than the church, as we grow into adulthood as a generation, Millennials are changing and shaping the world we are encountering and it is making our Boomer parents uncomfortable. Now, I am not sure that I, or we Millennials, have really got each other figured out. And only God knows what we would do at the helm of institutional church bodies. But as we constantly seem to wonder as Lutherans, as Mainline Protestants, as North American Christians “Where did the young people go?” Maybe one place to start answering the question is with the young people that are here. And the boomers don’t have to pass the buck to us quite yet (I think you could clean up the ecclesiastical and social messes you have made instead of leaving them to us), but you are more than welcome to include us Millennials in leading the church, heck society even, into the future. I will be the first to admit it. I am addicted to my iPhone. Most days I am much more willing to risk leaving my wallet or keys unprotected than my phone. I will leave my computer bag and my wallet in the car in bad areas of town, but I won’t leave my phone on my desk in an empty church when I go to the water cooler in the adjacent room. Electronic devices now dominate our time and attention. It is hard for many of us to be away from the constant stream of information. I am often glancing at facebook and Twitter, reading (writing) blogs, searching for something new to read, to learn, to laugh at, to be offended by, to think about, to distract. This morning, in his opening essay, CBC Q’s Jian Ghomeshi talked about unplugging and being present. He gave two examples of experiences, a wedding and a concert, where attendees were asked to not use, and even surrender their devices, in order to be present and fully experience the event. This Easter I had the chance to simply sit in the pew because I was in between calls. During the sermon, the teenager in front of me was playing games on his iPod Touch. And his dad was watching over his shoulder, and his grandma was annoyed. I think our default reaction is to be angry at a situation like this, to feel disrespected as pastors or long time church members. But here is the thing… I don’t think that teen had a choice. I don’t think his brain and body would have let him just sit and listen. He would have probably started “iWithdrawal” 30 seconds into the sermon. A few posts back I wrote about Old and New Thinking, saying that the church really doesn’t know why people have drifted away. I also said that people might start drifting back, and we won’t know why either. But I think, without really doing it on purpose, the church has become a place to unplug, to fully experience the here and now. A rarity in our world these days. Jian Ghomeshi mentioned a wedding and concert, occasional events that most of us might experience a handful of times a year. Yet, each week as I write my sermon, study scripture, prepare worship I have to slow down and be present. Each Sunday, as our congregation gathers, I get to put down the phone entirely. I get to fully engage and be present, to experience the here and now. The church, without being any different than it is now, provides a space to do that, week after week. 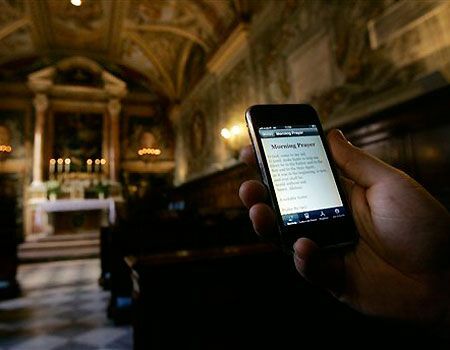 Liturgical worship is at one time a fully engaged experience of the present, and at the same time, the first and oldest form of social media. As I have heard it said, liturgy is like the stream of the faithful, of ritual and tradition, of history and community, of interconnectedness with people of all times and places. We get to wade, splash and swim in it, but the stream has been here long before us and will remain long after us. In liturgy we are bound together more powerfully than Facebook or Twitter, we see more deeply than Instagram, we weave stories and threads more powerfully than Pinterest, we proclaim wider scandal than Reddit, we experience something older and more forgotten than MySpace, we seek the lost and forgotten more thoroughly than Google+. When many in our world begin to discover our devices are really satisfying that part of our brain that drives us to eat too much, drink too much, smoke too much, use too much… places where we can put down the devices will become sought after. In fact, Jesus says something to Martha about that this week. And a place where we can put down the device but find an incredible social experience of community deeper than any network? Well, the church will always be that place. That may be an odd thing for a pastor to say. In a couple weeks, the lectionary appointed Gospel lesson will be Luke’s version of the Lord’s Prayer, and it has got me thinking about prayer. Now, maybe I should be more specific when I say, “I don’t get prayer”. Because I am am a pastor and I do pray a lot. And I get prayer in worship, at meal times, to open meetings, prayer with the sick and dying, with those who grieving, with those who are celebrating. So what was my problem again? Well, my problem is with a specific kind of prayer. Yet, Jesus was speaking to 1st Century Jews who were fearful of God, and for whom prayer was very prescribed and formal. Jesus encouraging a very restricted audience to broaden their prayer horizon. He was NOT speaking to North Americans who are accustomed to getting everything and having what they want. He was not providing prayer as means to get the things, the outcomes, the results that we want. So I don’t get prayer as so many of us do it today. To me prayer is a space set aside to be mindful of the divine. It is an experience of the sacred. It is a chance let go of those things that we cannot control, instead of demanding God provide the outcomes that we want for things that are out of our control. Prayer is acknowledging that God holds all of creation in God’s self, that God holds on all of my stuff, my issues, my problems. Yet, I don’t get to tell God what to do with them. So… maybe I do get prayer… just not North American Christianity.